Washington DC’s National Cherry Blossom Festival kicked off last Wednesday. The festival will run through April 14th and is the Nation’s greatest springtime celebration. The festival celebrates springtime in DC, the gift of the beautiful cherry blossom tree, and the enduring friendship between people of the United States and Japan. 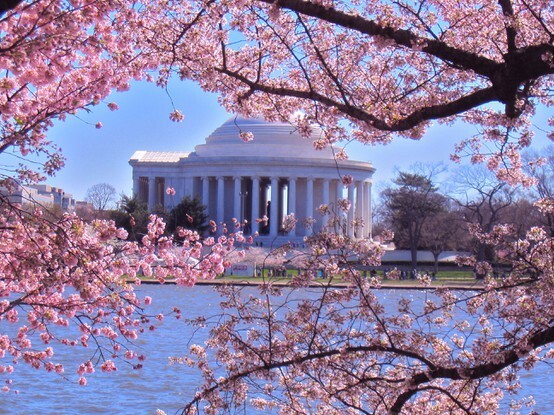 It commemorates the 1912 gift of 3,000 cherry trees from Mayor Yukiki Ozaki of Tokyo to the city of Washington, DC. Throughout the festival, various daily events will feature diverse and creative programming to promote traditional and contemporary arts and culture, natural beauty, and community spirit. Most of the events are free and open to the public. More than 1.5 million people visit Washington, DC during the festival to admire the trees and participate in the event. The festival parade will take place on Saturday, April 13th from 10am to noon. The parade runs along Constitution Avenue (from 7th to 17th streets N.W.) and features celebrity performances, giant helium balloons, colorful floats, marching bands from across the nation, and more. Grandstand seating can be purchased for $20, and there is no cost for viewing along the parade route. For a full list of the events by date, please click here. Matadornetwork.com has a photo and video of Emeryville, CA, just ~13 hours after the 8.9-magnitude quake displaced Pacific Ocean waters off the coast of northeast Japan. Churchill Corporate Services has disaster and emergency housing nationwide. Please call 866-255-0593 for more information.